Home to nearly 350,000 people, the City of Markham is the most populous municipality in York Region and the 16th-largest city in Canada. At one time an agricultural community, the city’s rapid urban growth was inspired by the effects of urban encroachment from Toronto just after World War II. To be truly prosperous, a community needs to be healthy and beautiful, two key benefits that have been naturally supplied by trees for time immemorial. Unfortunately, Markham’s trees have been significantly affected by the urban community’s “encroachment,” inspiring a major nature conservation effort in recent years. This is where Sequoia TreeScape comes in – the leading provider of professional tree service to Markham residents. Our team has been expertly trained in all areas of tree care, from pruning to cutting to complete tree removal. We have a keen eye for detail and in-depth knowledge of local tree preservation bylaws, enabling us to evaluate your property’s individual needs and implement the most efficient solutions for the desired health and beauty. 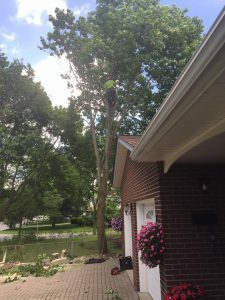 Most importantly, we remove a tree only when absolutely necessary and after obtaining all required permits, and we make every effort to minimize damage to surrounding trees and property. Furthermore, we understand that proper tree care can be difficult for an untrained homeowner, placing your own health at risk. Hiring a professional arborist ensures that you never have to attempt dangerous aerial work on your own, leaving you safely on the ground to enjoy your landscape’s beauty. As an added precaution, our work is covered by $5 million in liability insurance through the Workplace Safety & Insurance Board (WSIB). Are you ready to experience the difference of our superior tree service in Markham, ON? If so, we invite you to contact Sequoia TreeScape by calling (416)-770-8733 or completing our convenient online form today!